Welcome to The Green Bay Packers Uniform Database! "celebrating 90 years of looking good while playing well"
If you enjoy the Database, please visit our new blog at http://packersuniforms.blogspot.com/, where we will cover these and other packers uniform-related topics in greater depth. This database is an attempt to categorize all of the uniforms worn by the Green Bay Packers since 1919. There is a great deal of misinformation floating around concerning Packer uniforms. 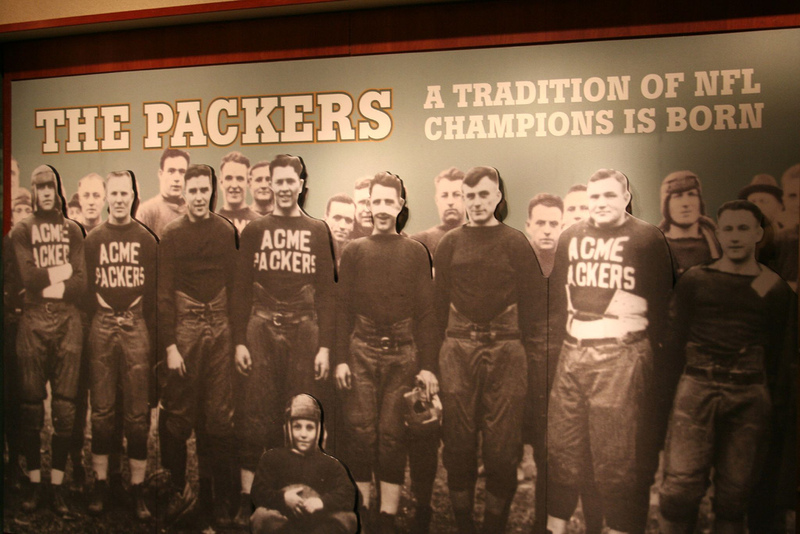 The cover of the Packers’ own 2004 media guide (left) shows incorrect replicas of a 1921 Curly Lambeau jersey and 1944 Don Hutson jersey (Hint: the font is all wrong for the 1921 jerseys, it should be sans-serif as seen here, and the 1940s navy jerseys with gold shoulders never had navy collars). If the Packers themselves can get it wrong, it should not be surprising that anyone else can and does. That is why I have created this database - to be the place to find accurate, documented information on the uniforms worn by the Green Bay Packers throughout their history. 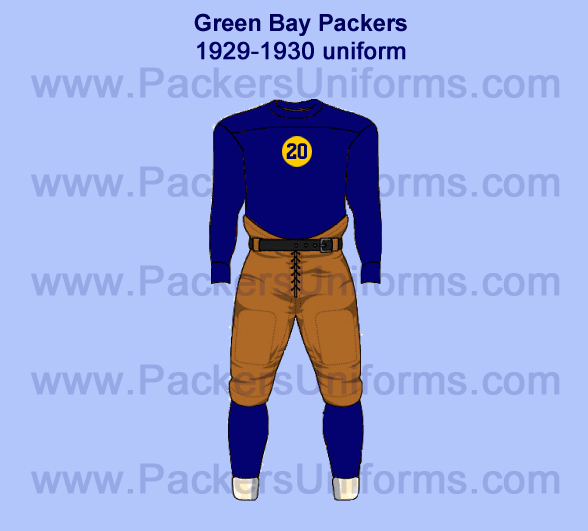 I am always looking for more information concerning Packer uniforms, especially early uniforms. Help me correct mistakes by leaving a comment on my blog - I won't publish any comments if you ask me to keep them private. I do request that any corrections be sent including supporting evidence. Written accounts are best, although photographs are also very helpful (please keep in mind, though, that black and white photos have their limitations). A Note on the Early Years: In the early days of the NFL, it was not uncommon for players to wear slightly different uniforms on the field. The uniform entries for each year reflect the predominant design of the club for that season - what the majority of the players wore, or whatever was the newest uniform. 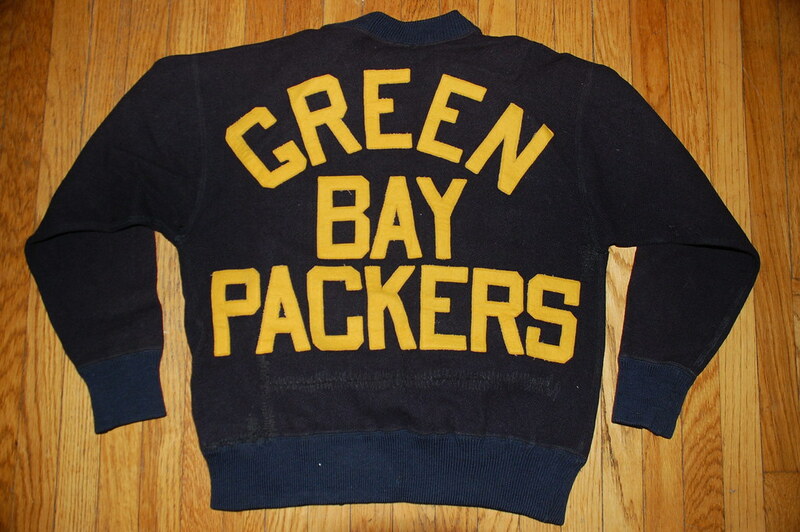 Before we begin the database, please join me in asking Mitchell & Ness to honor a Packer legend. Hutson invented modern pass receiving. He created Z-outs, buttonhooks, hook-and-gos, and a whole catalog of moves and fakes. Don Hutson was the first Packer to have his number retired. He is a charter member of the Pro Football Hall of Fame in Canton. And yet, despite all this, Don Hutson has not been immortalized by Mitchell & Ness. His teammate Tony Canadeo has been rightly recognized with a throwback jersey (two of them in fact, a 1949 home and a 1946 road), but Don Hutson has not. 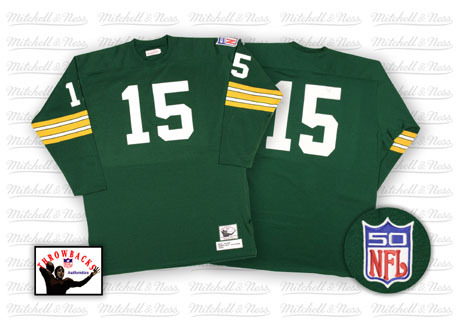 Contact Mitchell & Ness today and let them know that we want to see a Don Hutson jersey! Thank you for your help, and now on to the database! Note: in the book "Packers by the Numbers," the lettering is listed as being white, not gold. This is likely a mistake, as all other sources depict the lettering as gold. 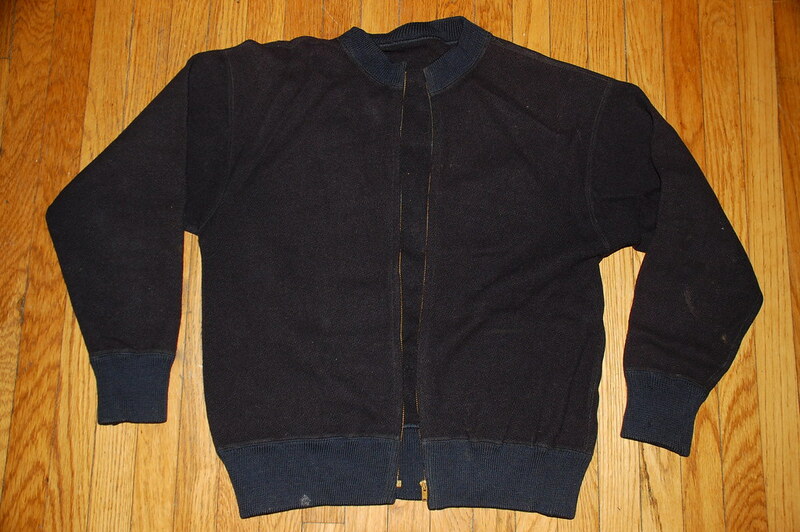 1929 Solid navy jerseys, with small yellow circle (~ 5" diameter) containing blue numbers on chest; solid tan pants Click here for a picture (Johnny "Blood" McNally) (HIST I, photo). This was the inspiration for the Packers' 2010-2014 alternate uniform. 1937 Introduction of the classic Lambeau-era uniform: navy jersey with gold shoulders and numbers; gold pants, blue socks; gold helmets Click here for a picture (Clarke Hinkle) (PBN)(TC). This would be the basis for the 1994 throwback home uniform (see below). 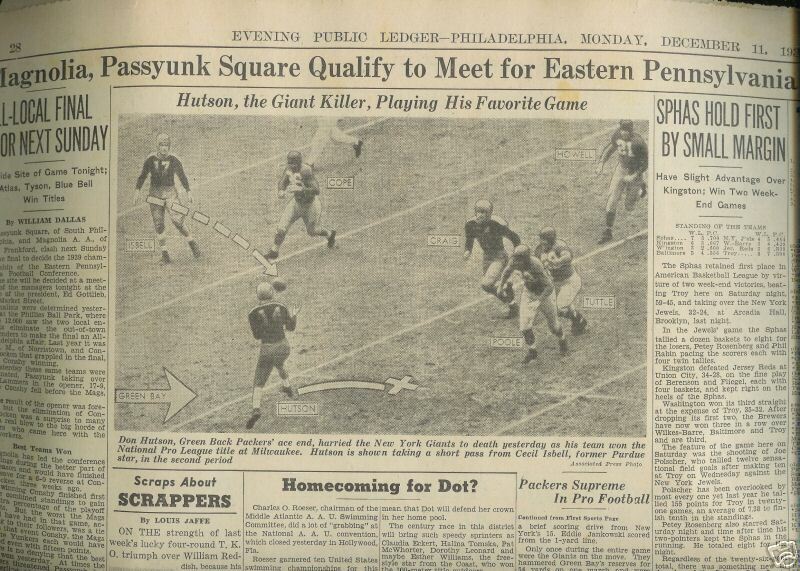 1939 Additional alternate uniform added: Solid white jerseys with green numbers, gold pants; white socks (PBN). Click here for details. This uniform was the basis for the throwbacks worn against Detroit on Thanksiving Day, 2001 (see below). The Packers wore the classic blue jerseys with gold yokes in the championship game with the Giants. Click here for a picture. 1946 Introduction of new alternate jersey, same as home but with white in place of blue: White jersey with gold shoulders, gold numbers; gold helmets and pants; white socks. This would be the basis of the throwback road uniform worn against the Bears at Soldier Field on Halloween Day 1994, with navy numbers instead of gold to improve legibility. George Halas refuses to outfit his Bears in road whites for games at City Stadium in 1954 and 1955. As a result, both teams wear dark blue jerseys. 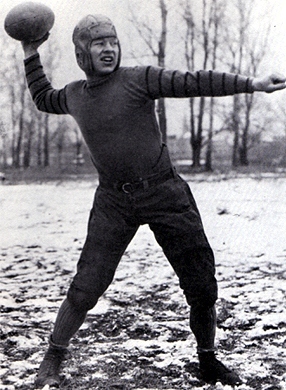 During this period, the Packers experiment with green facemasks before adopting gray through 1980. Click here for details. 1989 Pant striping returns to pre-1984 pattern (green/white/green); elimination of logo from sleeves (GBP03; 502). For the first time since the 1950s, the Packers wear white jerseys at home for the first two games of the season: a 23-21 loss to Tampa Bay in Week One and a 35-34 win over New Orleans in Week Two. The Packers have not worn white jerseys in a game at Lambeau Field since. 1992 Solid green socks added (GBP03; 502)(photo), Starter assumes contract for uniforms, their logo replaces MacGregor on the sleeves. 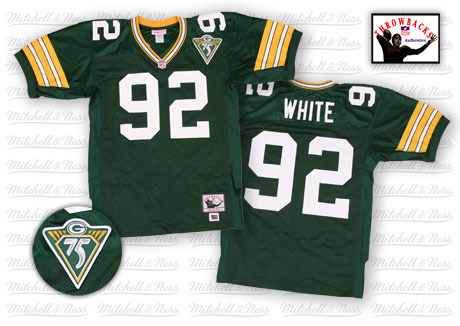 1993 Packers 75th anniversary patch added to left chest (as seen on this Mitchell and Ness reproduction Reggie White jersey) (GBP03; 502)(photo) Manufacturer's logo also appears on the pants. NFL requires that coaches wear team-issued (and team-branded) clothing on the sidelines. There was a rumor Sunday the Packers would have a press conference concerning their uniforms colors during the week following the Eagle game. This, however, seemed certain: The Packers plan to change their uniforms next season, retaining the current dark green, but switching pants and helmets from the present yellow to metallic gold. The Packers hope the changes will be approved by the NFL Properties by the beginning of next month so they can wear the new uniforms next season. Among other changes are the removal of stripes now on the helmet, jersey, and pants. Packer President Bob Harlan told the Milwaukee Journal the gold was not the same as that worn by any other team and that it was selected by General Manager Ron Wolf and Coach Mike Holmgren. Harlan said the helmet would be switched from yellow to gold and have a large green "G" on each side and the jersey would have a smaller green "G" on each sleeve. The white numbers on the green home jerseys and the green numbers on the white road jerseys will also have a gold outline. The pants will be plain gold. "Years and years ago, we wore a gold helmet and gold pants," Harlan said. "And I think that's what Ron wanted, a simpler uniform. They didn't want to look like New Orleans or the 49ers. They looked at different golds and picked out what they liked." 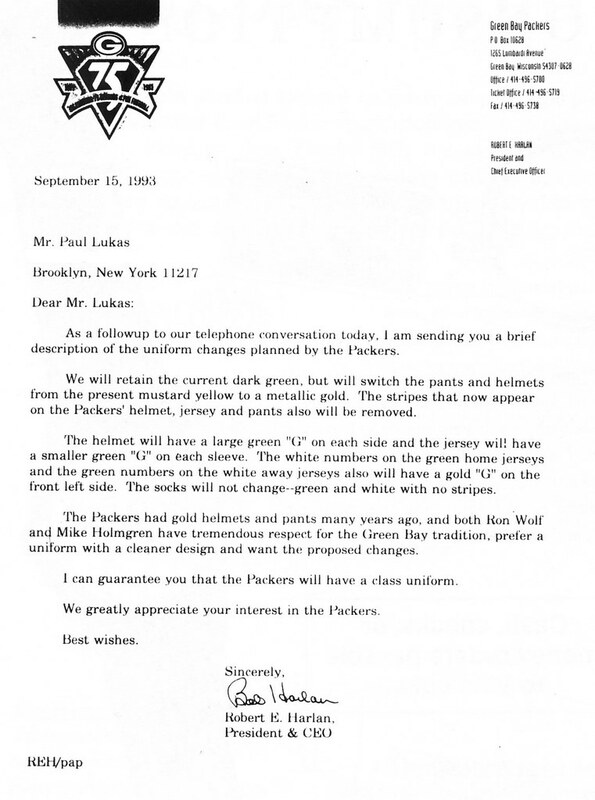 (I) once sent a letter to the Green Bay Packers, urging them to reconsider their plans to change their uniforms and color scheme (this was in 1993, six years before the advent of Uni Watch), and was surprised to get a phone call and a note from Packers CEO Bob Harlan (who, fortunately, later changed his mind about all the uniform changes described in that letter). "I never liked the yellow color in the Packers scheme," Wolf said. "NFL books say it's 'green and gold' but anybody can see it's a Michigan kind of yellow, of maize, which didn't sit well with me. "I put together a proposal to change Green Bay uniforms, replacing the yellow with a gold much like we see on Rams uniforms and helmets. There were some other changes but I wasn't messing with the "G' on Packers helmets. "Everything was approved by the seven-member executive committee that operates the Packers. All I had to do was give the go-ahead. 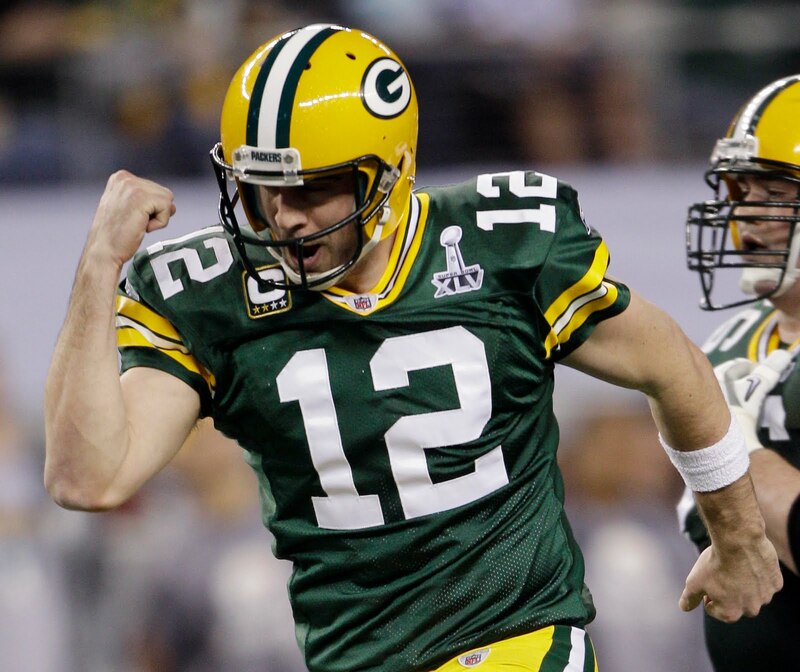 "I repeatedly looked over drawings of the new Packers uniform, thinking I would soon be pulling the trigger on changes. But, after a little more thought, decided it just didn't fly. We needed to fix what was truly broken. What we really had to have was better people on the field." If the Lombardi-era uniforms were ever to be radically changed, that was the time. The Green and Gold has since regained its prominence, thanks in no small part to the team that Wolf put on the field. If the Packers had won a Super Bowl in these uniforms, there is a possibility that the fans could have come to accept the change. In recent interviews, Ron Wolf has since reiterated his preference for a metallic gold over the Packers' yellow. In celebration of the NFL's 75th anniversary, all teams wore throwback uniforms during some point of the season. The Packers wore throwbacks modeled on the classic 1937 Lambeau-era uniforms. There were two versions of this uniform: a navy home uniform, and a white road uniform. 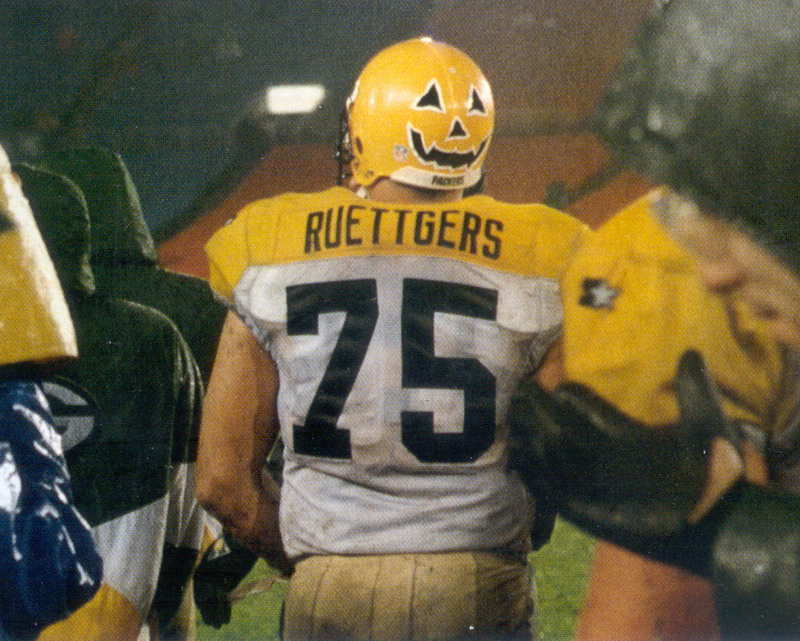 The Packers wore these uniforms at least four times during the 1994 season. Click here for picture vs. Philadelphia. Click here for picture vs. New England. Click here for picture vs. Tampa Bay. 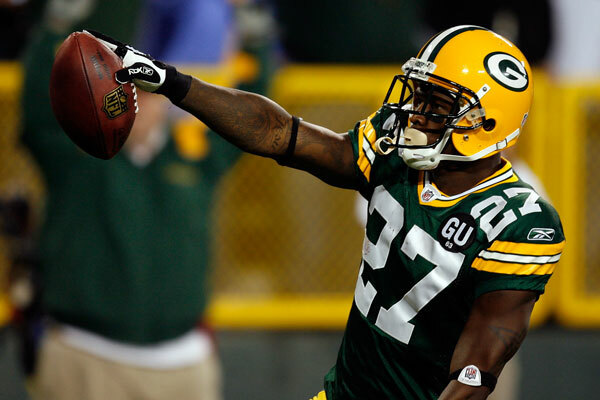 The throwback jerseys featured sewn-on tackle-twill numbers, which wouldn't return to the Packers' regular jerseys until the next season. 1995 Silkscreen numbers replaced with sewn-on versions. 1996 Super Bowl XXXI (Jan. 26, 1997): Special helmet decal worn to honor former Commissioner Pete Rozelle, who died December 6, 1996  script "Pete" over the NFL shield. Click here for picture. Super Bowl XXII (Jan. 25, 1998): For the first time, Super Bowl logo patch worn on left chest. Click here for picture. solid white jersey with green name and numbers, solid tan pants, solid gold helmet with grey	facemask, black shoes (photo, own) Click here for picture (Ahman Green). 2003 Lambeau Field rededication patch worn 09/14/2003 (photo) Click here for picture. "3" decal added to back of helmet for all games starting with December 7th (Week 13) to honor Tony Canadeo after his death. Click here for picture. "40" helmet decal worn for one game on September 19th (Week 2) against the Bears. This decal was worn by all 1,440 active players to honor Pat Tillman, the first NFL player killed in combat since the Vietnam War. Click here for picture. "92" decal added to back of helmet for all games starting with January 3rd (Week 17) to honor Reggie White after his death. Click here for picture. "FÚTBOL AMERICANO" helmet decal worn for one game on Monday Night Football, October 3rd (Week 4) at Carolina. This decal was worn by all NFL teams in Week 4 to commemorate the first time regular-season game played outside the United States  the Arizona Cardinals vs. San Francisco 49ers, played on October 2 in Mexico City's Estadio Azteca). Click here for picture. 2007 Lambeau Field 50th Anniversary patch worn on home jerseys Click here for picture. Black "21" helmet decal worn by all teams in Week 14 game to honor murdered Washington safety Sean Taylor. Players are allowed to wear the decal for the remainder of the season. Click here for picture. NFL institutes a standardized uniform patch for team captains. Patch is square, bordered in gold, incorporating a sans-serif "C" above four white stars. Stars are colored gold, left to right, for each season of a captain's tenure (starting with 2007). For home jerseys, the "C" is white against a background of the jersey color (teams such as the Giants have standard blue and alternate red versions). For road jerseys the "C" is in team color against a white background. The Packers (along with roughly one-third of the league) elect not to use the patches in the regular season, because they select captains on a game-by-game basis. The team selects captains for the entire post-season, though, and so the patches are added to Packers uniforms for the playoffs. 2008 Updated NFL shield introduced starting with the 2008 Draft. New shield appears on updated "NFL EQUIPMENT" tag on uniform. After wearing white cleats in pre-season games, the Packers to black shoes for the regular season, the first time (excluding throwbacks) the team has worn black since 1974. 2009 No new changes to uniform. For October 5th Monday Night game in Minneapolis, certain Packers wear pink gloves, shoes and accessories as part of NFL initiative to raise breast cancer awareness. Special pink-ribbon logo is added to the back of helmets, and sideline gear is trimmed in pink. Click here for details. As in 2007, the Packers eschew the League's captain patches during the regular season, but issue them for the playoffs. 2010 New alternate uniform added, based on 1929 uniform, worn against the 49ers on December 5th: Navy jersey with navy numbers in large gold circle on chest, gold name and numbers on back. Canvas-colored pants, navy socks, brown helmet with gray facemask (to simulate leather helmet). The 1929 details have been updated to reflect current NFL uniform regulations: the circle, which was originally ~5 inches in diameter, has been enlarged, and the Reebok and NFL logos are retained in this uniform. 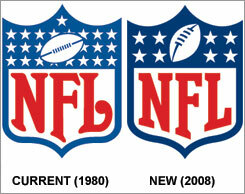 NFL regulations require each alternate to have a 5-season lifespan, so no other alternate can be introduced until 2015. Click here for a photo and more details. Once again, the Packers eschew captain patches during the regular season, but issue them for the playoffs. 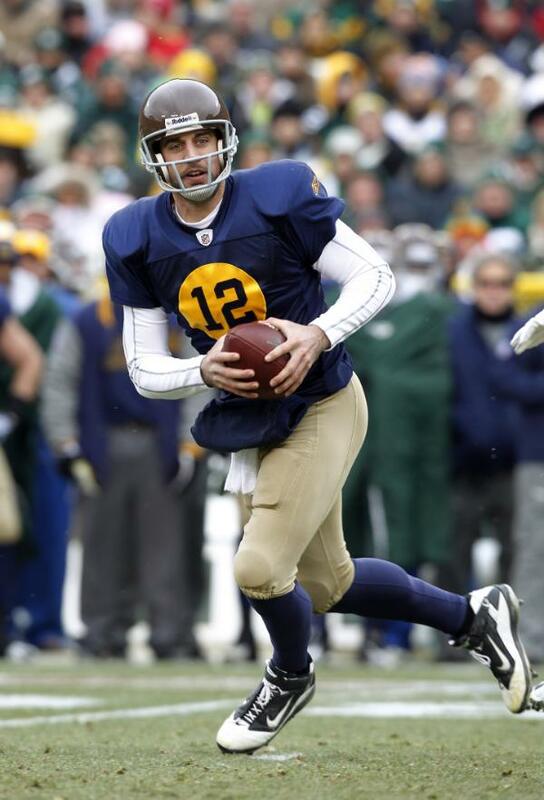 2011 The Packers wear their throwback uniforms (now designated "re-created 1929 uniforms") on October 16th against the St. Louis Rams at Lambeau Field. TC Tony Canadeo biography "In Seach of a Hero"
ECL Curly Lambeau biography "Lambeau: The Man Behind the Mystique"
PBN "Packers by the Numbers"
DISCLAIMER: All team and league information, sports logos, sports uniforms and names contained within this site are properties of their respective leagues, teams, ownership groups and/or organizations, and may not be reproduced in any form without the permission of said entity. This site is maintained for research and historical purposes only. Any information obtained from this site may not be sold to any third parties.